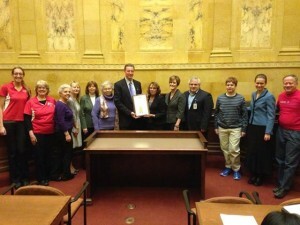 Thursday was a day devoted to raising awareness of Diabetes in Wisconsin, as World Diabetes Day was marked at the Capitol. Joey Balistrieri is a Wisconsin Youth Ambassador for the American Diabetes Association. He has Type 1 diabetes which is usually diagnosed in children and young adults, in which the body does not produce insulin. Joey’s message to other young people in his situation is empowering. “They shouldn’t be embarrassed that they have it. They didn’t ask for it, so they shouldn’t be afraid to tell people that they have it,” said the student at Holy Apostles School in New Berlin. In Wisconsin, some 500,000 people have a diagnosis of diabetes, a number that is soon expected to exceed 700,000. Diabetes educators say diet and exercise remain key to controlling Type 2 diabetes.